This page is about the French medium tank AMX M4. For other uses, see M4 (Family). The AMX M4 is a Rank IV French medium tank with a battle rating of 6.7 (AB/RB/SB). It was introduced in Update 1.75 "La Résistance". It uses the same 90 mm SA45 cannon as the ARL-44 but has a 7 rounds auto-loader and a better armour pattern while being more mobile. It is clearly better than any rank III French tank, offering a new battle opportunities. This is the sturdiest representative of French rank IV vehicles, from which he shares some common features: it has good mobility, an oscillating turret (fitted with an auto-loader), sloped armour in front and back, high hull, high gun placement, good gun depression, 4 crew member, a coaxial MAC 31 machine gun and large tracks. What distinguishes the AMX M4 is its Panther-like hull, its efficient 90 mm SA45 gun inherited from the ARL-44 and the thickest armour pattern of all French ground forces with 80 mm sloped at ~55° in the frontal area. As said above, this tank's armour is very similar to that of the famous German tanks, it's hull even shares the same general patterns and dimensions, the distinctive features being...weak spots: an almost flat portion between UFP and LFP and two 60 mm "corners" above the tracks. As for the frontal turret part, it is sufficiently thick to endure many nasty hits, as long as you do not leave your foe enough time to aim: the turret ring area, while still being 80 mm thick, is flat. As for side armour, it is a good reason to keep away from front line duty: 35 mm flat armour does not protect from anything bigger than HMG fire. the hull's back is sloped, which may deviate some shots and prevent long-range "back flanking". The most exposed part of this tank is the turret's back, with only 20 mm of armour between the bulge and the turret ring. In sum, engage frontally, avoid anything bigger than a slight angle as it may expose the 60 mm UFP "corners". Distance is a great tool to avoid your weak spots being easily targeted. This armour's role is quite fluctuent as it depends on if what it face can penetrate it or not. 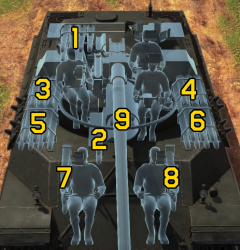 Any French rank IV tank has a good gun capable of going through most armours at standard combat ranges (and above), they are even more frightful when knowing about their good reload rates (they all have autoloaders). With that in mind, engage them first so that they (maybe) will not have enough time to reload a second shell. Specifically to the AMX M4, this tank's armour is virtually as resistant as a Panther tank: if you can't go through a Panther, you neither cannot with this tank, unless you shoot its weak spots. Don't panic though, its side armour is only 35 mm, which makes it very vulnerable to flanking and "multi-target" engagements: it can't protect itself well from two tank if they are enough apart from each other. As for flanking onto a single AMX M4, it must be dealt with quick: its fast turret turning speed allows it to react quite fast to either of its sides. Try to disable its large gun breech first so it won't be able to fire in a long time (this may also ammo-rack it if detonating a pre-loaded ammo), only then finish it off, if the first hit/series of hits (SPAAs) does not disable it from firing back, consider yourself done. The turret and the base overlap in some areas, leading to cumulative armour. Post-war French designs are all very good at moving around: they have good engines, wide tracks and can easily achieve ~40 km/h on most terrains. The AMX M4 may be the worst of them all, on par with the AMX-50-100 as they share a very similar hull, they still have above average mobility, when compared to other medium tanks at the BR. This observation is imbued by the fact that this tank's reverse speed only reaches -5 km/h and it does not have the ability to do neutral steering, anything else is comparable to its contemporaries. 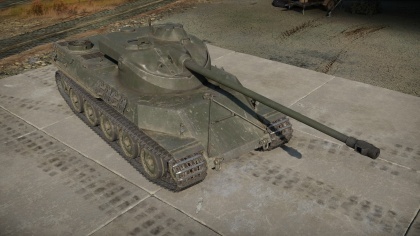 The gun may feel a little lackluster in terms of penetration: at the same BR, some tanks can consistently punch through more than 200 mm of armour while this tank's gun can't. This little defect is palliated by its auto-loader mechanism, providing up to 9 rounds a minute, a very good firing rate for the BR. All French medium rank IV tanks share this good reload rate, this is their prominent selling point. The oscillating turret design also allows an high gun placement, this means you can fire over hills by exposing only the strong top portion of your tank, even more so with its good depression angles. When it comes to elevation, there is a problem: this tank can only lift its gun 15°, which make defending against planes impossible and uphill battle a bit challenging. Ammo racks of the AMX M4. At its BR, 80 mm of sloped frontal armour is more than sufficient to endure close range fights (as long as it is facing the enemy with its frontal armour). 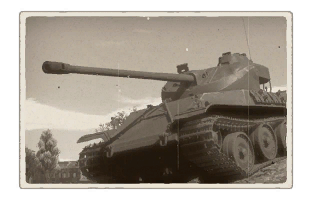 But what this tank is really good at is, as any other French rank IV, sniping: a very good gun, great depression and fire rate make it very deadly, even more so that it can take a few hits. The AMX M4 offers the best survivability of all French rank IV tanks since its BR is low and armour, thick. It is a true "medium tank" capable of all roles, given the good context. This is clearly this tank's intended role: at all BR placements, it provides the best results from this tank. There is only a few things that can defeat such tactic: drastically better firepower and thick frontal armour faced towards it. This gun's performance is not the best at its rank, in that way, the AMX M4 may have to rely on surprise attacks to its foe's sides in order to disable them. Use this tank's great mobility to get into a good spot and reposition whenever it is needed do not allow approaching targets as they increase your chances to be dealt with. Don't bother falling back before it is needed: your reverse speed won't allow for hasty retreats. When facing lower BR tanks, the AMX can easily be used in the same role as Panther tanks: breakthrough...but with reserve, your side armour won't allow even the slightest side shot. Use your good reload speed and turret rate to their best: fast reaction times and multi-target engagements are possible. Got a light tank squad wanting to flank ? Go with them and provide extra firepower for these vulnerable scouted targets. All considerations from the "sniper" role can be taken into consideration when flanking, the only difference being a more consistent usage of this tank's mobility. Front glacis is 80 mm and is heavily sloped for a high chance of ricochets, similar to Panther's. Very good reload rate between 7 shots due to auto-loader. Good gun depression of -8°. Overall armour is quite thin as for 6.0 medium tank. Long reload time after 7 shots due to auto-loader. Only two ammo choice between APC and HE rounds. Ammo always held in reload mechanism makes it easy ammo rack targets. 60 mm UFP "corners" makes angling ineffective. The AMX M4 was developed and tested in the late 1940s, though it never saw active service.